The Haji Ali Dargah is a mosque and dargah (tomb) located on an islet off the coast of Worli in the southern part of Mumbai. Near the heart of the city. Haji Ali Dargah is one of the most recognisable landmarks of Mumbai. Haji Ali Dargah is a reminder of the multi-cultural roots of Mumbai. It is open to all people irrespective of their faith.Haji Ali belonged to Bukhara, which lies in present-day Uzbekistan. 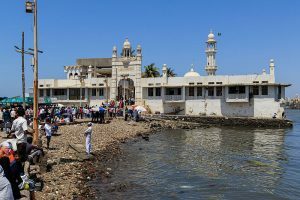 This shrine has a mystical story attached to it.Haji Ali Dargah is a celebrated Islamic shrine, which earns immense recognition across the globe. It is located 500 yards into the Arabian Sea..
Mahalaxmi, also spelled Mahalakshmi, is a railway station on the Western Line of the Mumbai Suburban Railway in Mahalaxmi, Mumbai. Trains starting from Churchgate pass through Mahalaxmi. Rail: Haji Ali is well connected by local trains. On the Western line one needs to get off at Mahalakshmi Station or Mumbai Central Station, while on the the Central (Main) line one needs to get off at Byculla Station and take a B.E.S.T. bus / Taxi. Road: Haji Ali is well connected on the arterial route connecting South Mumbai with the western suburbs. When coming from the Airport / Western Suburbs one needs to travel via, L. J. Road, Shivaji Park, Prabhadevi, Worli or via the Sea-link to Worli and then on to Lala Lajpat Rai Marg (a.k.a. Hornby Vellard) to reach Haji Ali. When coming from the Central Suburbs / Navi Mumbai, one needs to drive via Ghatkopar (Eastern Express Highway) / Chembur / Kurla to Sion, Matunga, Dadar and cross-over to Shivaji Park, Prabhadevi, Worli or via the Sea-link to Worli and then on to Lala Lajpat Rai Marg (a.k.a. Hornby Vellard) to reach Haji Ali.